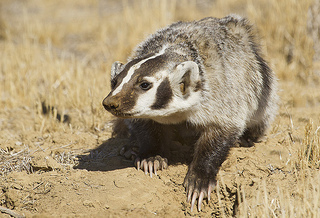 This badger actually looks friendly compared to my daughter this morning. Courtesy of Flickr Creative Commons. All rights reserved by marlin harms. The recent time change has been a killer here in our house. Add to this some extra doses of stress due to this and that, and none of us seems to be adapting as of yet. It is all I can do to drag myself out of bed each morning, and pushing and prodding my daughter out of hers has become a chore neither of us particularly enjoys. Let me preface this by saying that Savannah is truly one of my favorite people in the world, and I would say that even if I weren’t her mother. Like her brothers, she’s wickedly funny, sweet (at least she was, before she turned 13 and I became an idiot! ), and smart to boot. She’s cute as a button, loves little kids and animals, and can make the best tuna-melt sandwich you’ve ever tasted. However… She is NOT a morning person. Not even a teensy-little bit. Driving her to school this morning, I tried to break into her hard, sleep-encrusted-eyes shell and get her school day started off with a smile. We had had a rough start to the drive when she accidentally dredged the shirt she brought to change into in my uncovered coffee (because of course she had to change at the last minute, even though she’d been dressed for an hour already – but I digress). Never mind that extremely valuable and needed caffeine molecules were being sucked out of MY cup by the cotton! Somehow it was my fault that the shirt ended up in the mug. Each attempt to brighten her day was met with deadpan stares or the put-upon sigh that only a 13-year-old can pull off. Because I love you, Yes I do. And… Cue the eye-roll! I laughed hysterically while she turned away, but not before I saw the grin she was trying hard to hide. Needless to say, it was just what I needed to get my day started off right, and probably hers too, though she’ll never admit it. I am to the stage where I tell them to knock it off or I won’t try to help them with Algebra. I’m no help when it comes to algebra, either. In fact, that was our battle last night… Grrr! My 12 1/2 year old has been a bear with a sore behind lately, too… the days begin rough and don’t stop until we send her to bed that night. I feel your pain.